If you are in need of a durable and safe shower seat, this HomCom bath chair is perfect for you. Made of sturdy aluminum with a polyethylene seat this chair is able to withstand repeated shower use. This chair is perfect to be used as a support or to sit on while cleaning yourself in the shower or bath. Each leg comes with an attached suction tip to provide extra stability while in use. The seat comes with detachable arms as well as drainage holes to make sure water never pools up and to reduce the potential for slipping. This chair is perfect for elderly or handicapped people in need of assistance in the shower. Don't fear slipping in the bathroom anymore with this sturdy HomCom medical bath chair. 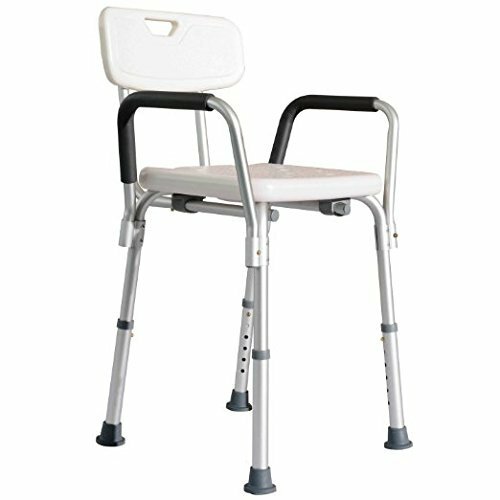 FEATURES: - Detachable arms on each side of the chair, - Drainage holes to reduce slipping and water pooling, - Suction tips on each leg for improved stability, - Made of durable aluminum and a polyethylene seat, - Adjustable seat height. SPECIFICATIONS: - Color: White, - Overall size: 21"L x 16-17.5"W x 28.5"-33"H, - Seat size: 15.5"L x 13"W x 2"H, - Seat height: 16.5" - 21.5", - Supporting tube diameter: 1", - Backrest height: 13",- Handle height: 6" from seat, 12" overall,- Max. Weight capacity: 300lbs, - Product weight: 8.4lbs. ✔ REGAIN YOUR INDEPENDENCE: If you or someone you know suffers from aging ailments or from issues related to injuries, this seat can give you the power to regain freedom and live an assistance-free life while still keeping to an everyday routine. ✔ ADJUSTABLE SEATING HEIGHT: Sturdy aluminum legs are adjustable to raise or lower the polyethylene seat height from 16.5" to 21.5" helping you find the perfect height for your body type or level of flexibility. ✔ SLIDE PROOF SUCTION: Each foot is equipped with a mold-proof, suction cup to help stabilize the chair, which paired with the drainage holes in the seat, helps prevent unwanted sliding and falling during showers or baths. ✔ REMOVABLE ARMRESTS: Durable padded armrests are independently attachable and removable without the use of tools and can give support when needed or can be removed for larger or injured chair occupants. ✔ LIGHTWEIGHT AND PORTABLE: Lightweight plastic and aluminum help this seat weigh only 9 lbs making it easy to transport for use wherever it's needed; Perfect for vacationers or frequent travelers.